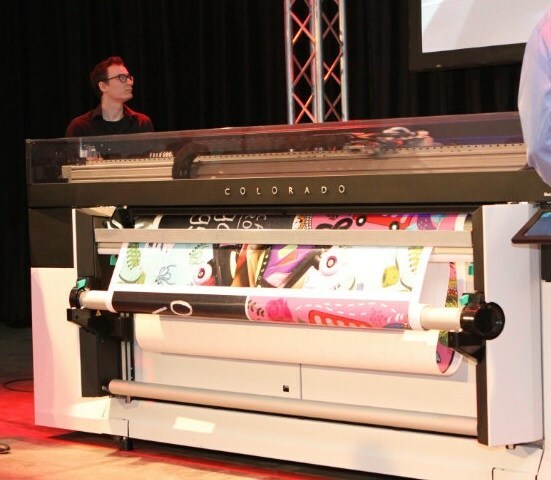 Canon is currently doing a country wide launch of their first 64” roll-to-roll production printer, the Océ Colorado 1640 using Canon’s UVGel Ink technology. Using one on one presentations at the country's major centres, Garry Muratore, Canon's Product Manager for Display Graphics will use his wealth of technical know to introduce this new technology. These features all result in cost-effective, non-toxic, durable, color fast, high-quality prints for almost any flexible media application. •Continuous, on-the-fly, nozzle performance compensation facilitates confident unattended printing and reduced print waste. They also reported that at about this time they will launch the new Océ Colorado 1640. This new printer is reportedly the fastest 64 inch printer on the market. It boasts a top speed of 159 square metres per hour and delivers high quality, POP prints at 40 square metres per hour faster than any competing system in this segment. The new, technologically advanced UVgel ink instantly gels on contact with media resulting in precise dot gain and positional control, perfectly repeatable images, and instantly cured, durable prints. The state-of-the-art low temperature LED-UV curing system moves independently from the printing carriage thus enabling uniform, post-print UV curing that further contributes to print speed and print quality. Confident unattended printing, automated quality assurance, unattended roll change, and reduced print waste all significantly contribute to overall productivity.